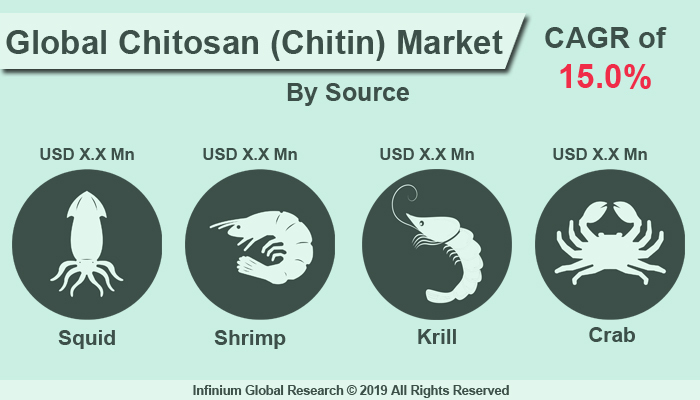 A recent report published by Infinium Global Research on chitosan (Chitin) market provides an in-depth analysis of segments and sub-segments in the global as well as regional chitosan (Chitin) market. The study also highlights the impact of drivers, restraints, and macro indicators on the global and regional chitosan (Chitin) market over the short term as well as long term. The report is a comprehensive presentation of trends, forecast and dollar values of global chitosan (Chitin) market. According to the report, the global chitosan (Chitin) market is projected to grow at a CAGR of 15% over the forecast period of 2018-2024. Chitosan also is known as deacetylated chitin, is a sugar, which is extracted from the shells of crustaceans such as lobster, crab, and shrimps. The waste shell categorized with a high amount of chitin is further treated to produce glucosamine. It is used to treat Crohn's disease such as Ileocolitis, obesity and high cholesterol. Further, it is also used in the treatment of insomnia, and anemia. Chitosan is also produced from certain fungi. Due to the non-toxicity property of Chitosan, it is used as an absorbent material for removing waste from water. Thus, increasing the usage of Chitosan for the treatment of wastewater is driving the demand for the Chitosan market. Further, owing to moisture-retention abilities the application of chitosan has increased in cosmetics industries this has resulted in boosting the market growth. Growing application of Chitosan in food & beverage, agriculture, pharmaceuticals, paper, textiles, and others are fueling market growth. Chitosan is also used as a fining agent in winemaking. Fungal sources of Chitosan decreases oxidized polyphenolics in wine & juice and control the decay of yeast Brettanomyces. Moreover, rising demand for bio-based color cosmetics such as eyeshadows, nail polishes, lipsticks and so on is estimated to push demand for the chitosan market during the forecast period. In addition, usage of chitosan in biomedical applications such as drug carrier, wound accelerator, fat binder, and other is likely to generate growth opportunity in an upcoming year. On the other hand, the high production cost of chitosan and inconsistency of the products due to weather and chemical factors may hamper the growth of the chitosan market. The report on global chitosan (Chitin) market covers segments such as source, and applications. On the basis of source, the sub-markets include squid, shrimp, krill, crab, and others. On the basis of applications, the sub-markets include food & beverages, water treatment, cosmetics, biomedical & pharmaceuticals, paper industry, textile industry, agriculture, photography, and others. The report provides profiles of the companies in the market such as Agratech LLC, Advanced Biopolymers As, Heppe Medical Chitosan GmbH, Qingdao Corporation, Primex ehf, Novamatrix, Foodchem International Corporation, Golden-Shell Pharmaceutical Co.Ltd, KitoZyme SA, and Panvo Organics Pvt Ltd. The report provides deep insights into the demand forecasts, market trends, and micro and macro indicators. In addition, this report provides insights into the factors that are driving and restraining the growth in this market. Moreover, The IGR-Growth Matrix analysis given in the report brings an insight into the investment areas that existing or new market players can consider. The report provides insights into the market using analytical tools such as Porter's five forces analysis and DRO analysis of chitosan (Chitin) market. Moreover, the study highlights current market trends and provides forecast from 2018-2024. We also have highlighted future trends in the market that will affect the demand during the forecast period. Moreover, the competitive analysis given in each regional market brings an insight into the market share of the leading players.